We all know we should eat less meat. And if Paul and Linda McCartney didn't convince you in the '80s, maybe the latest advice from doctors and environmentalists is reminding you that bacon is not one of your five a day. However, being vegan can be a big lifestyle change, and while our tastes are somewhat more diverse than they were 50 years ago, many of us still base our meals around the classic meat and two veg. What's more, when it is cold and miserable outside, the idea of cutting out some of your family favourites does not sound appealing. So, whether you are trying to convert to veganism, or just want some easy meat-free recipes to add to your repertoire check out these comforting and tasty dishes from Yumbles that just so happen to be animal product-free. It's the pie that is vegan, not the shepherd – although they might be too once they give this a try. Cosy up with this classic winter warmer, made with lentils, lots of veg and a filling sweet potato topping. Make a batch ahead and whack in the oven when you get home for a no-fuss meat-free dinner. Garnish with rosemary, then bake for 30–45 minutes until the top is golden. Looking for a new cooker with plenty of space on the hob and plenty of ovens? Check out our guide to the best range cookers. Roast the peppers ahead and store in the fridge, or buy ready-roasted in a jar and you can whip this tasty vegan meal up in the time it takes to boil a pot of spaghetti. If you want a lighter alternative, swap the spaghetti (or maybe just half of it... ) for spiralised courgette to boost your veg intake. Don't have a spiraliser? Most supermarkets sell zoodles (zucchini noodles) with their fresh produce. 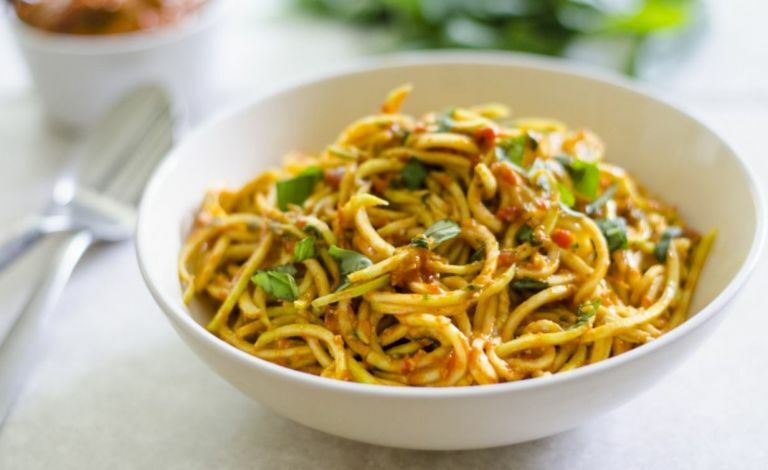 Toss your cooked spaghetti or zoodles in the red pepper pesto. Garnish with some finely sliced basil. Whip up this red pepper pesto in no time with one of the best blenders on the market. And now for a sweet treat. These raw coconut caramel slices are a bit like millionaires shortbread, but packed with healthy fats and not so packed with sugar. They're perfect for a packed lunch, a mid-morning pick-me-up or that something decadent after dinner. Press into a 2inch deep baking tin, lined with baking paper and set aside. Pour on top of the base. Chill in the fridge for a couple of hours until set, then cut into squares. Chop, mix and whisk up a treat with these mixers and food processors.